TAFS Attorneys are one of the most successful whistleblowing firms who were looking for a company to create a new web design complying with new technology. They have recently just achieved a settlement of over 6 billion dollars. The relaunch of the website had two aims: firstly, to provide an easy-to-use, informative platform for potential clients; and secondly to optimize their new website in the competitive market. They needed a way to notify their audience of how they could be defended if they were victims of fraud, negligence or mismanagement. Using our tested approach to website design, we produced an elaborate wireframe to establish the basic structure of each page and the overall UX/UI for the website. Once this was accomplished, we worked with TAFS to conceptualize a design that showcased the Firms expertise. Based on the final designs, we worked on a responsive HTML markup and developed a custom WordPress theme. Examples of the firms’ accolades and expertise were streamlined on the home page to promote their services and high success rate to clients. We opted for a modern theme which added a sleek finish to the new responsive and mobile-ready website. Since the launch of the website, there has been a growth in traffic and website inquiries. 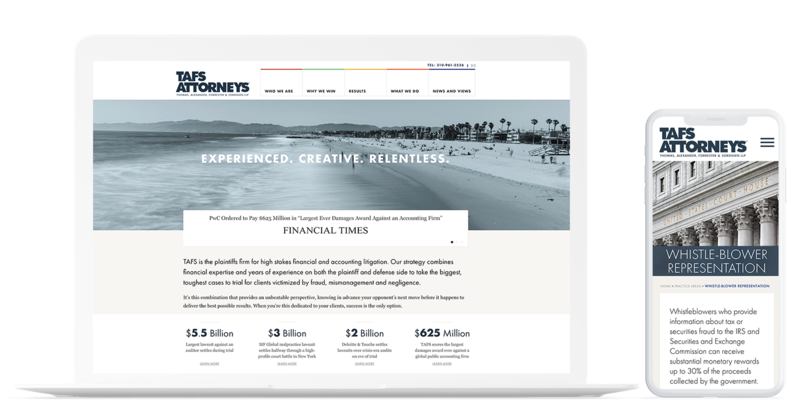 Coupled with their reputation and the launch of their new website TAFS Attorneys is becoming one of the sought for trial practices worldwide.